This year we planted several types of potatoes purchased at several different places. We had potatoes that were saved from last year’s crop, potatoes bought on the cheap ($0.99/lb) from two different farm stores, and potatoes that were certified disease-free from Territorial Seed Company. The latter cost the most. We knew that we were running a risk planting the saved potatoes and the cheap farm store potatoes as there was no guaranty they would be viral free, but we wanted to experiment and see if there was a difference that justified the cost of the disease-free seed potatoes… Well, here is a picture of our three potatoes rows. 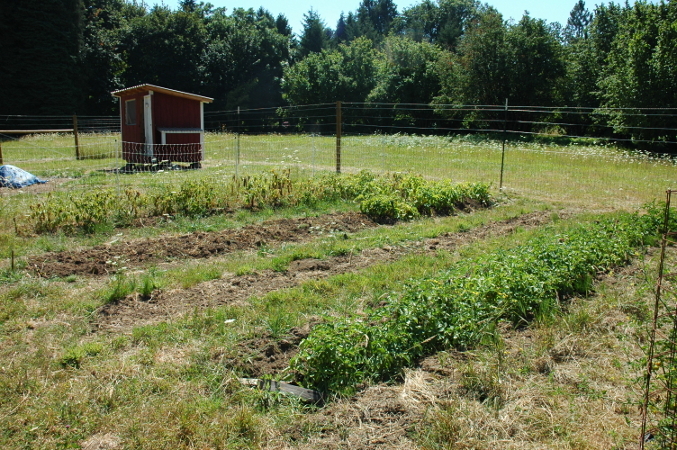 The row in the front is entirely certified potatoes and still looks very healthy. The next row, where part of it is missing, isn’t doing well. The Red Norland (farm store seed) is completely toast (as in, no longer exists) while the very end of the row is a white variety and is hanging on barely. The last row looks really rough and is also trying to hang on. So the moral of the story for us is: next year pay the price for certified seed and don’t save potatoes and replant them the year after (even though some people swear by it). You live and learn and experiment and try not to cry when your crop goes completely bust. I’ve got a similar experiment going on. I just planted some of our spring crop potatoes. I hear you about the certified seed potatoes, and am puzzled as to how to become self-sufficient with our potato crop. Surely it can be done. Very interesting experiment! Thanks for the knowledge! I can’t tell from your photos, but some varieties mature much earlier than others (Red Norland for one) and you may be seeing normal dry down of the vines. Potato vines naturally die at the end of the growing cycle, so dead brown stems are normal, unless you actually saw signs of blight, black spots on leaves and stems etc. This has not been the best year for gardens in the Pacific Northwest for sure!! Throwback – I hadn’t thought about that option. The problem is that these plants died in a manner very different than we’re used to. I expect the progressively-browning stems, whereas these plants pretty much wilted. The leaves shriveled, the stems turned black, soft, and appeared to be rotting, and when I pulled a plant I found many marble-sized unformed potatoes down the stem. We did, ultimately, find quite a few full sized potatoes down the row, but it was by no mean a bumper crop. Then again, it’s has been a pretty awful year.